Cooking is all about combining flavours and timing and very little else. 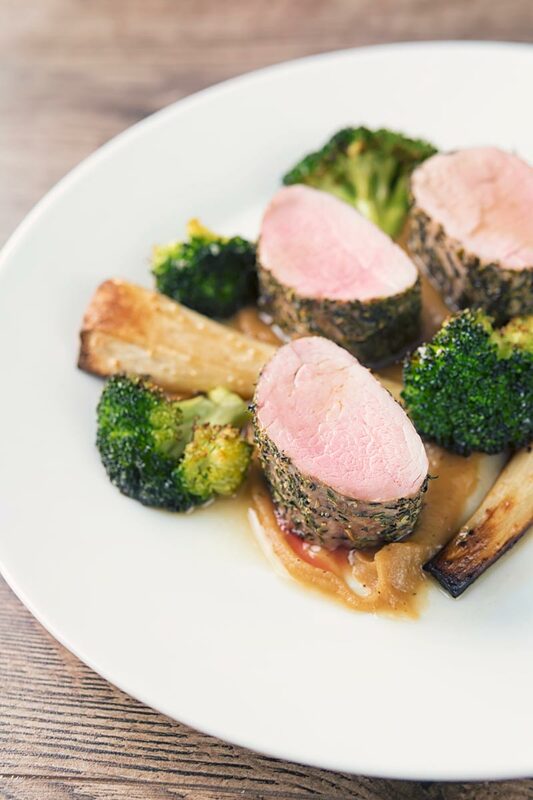 This complete meal combines roast pork fillet with baked apple puree, roasted parsnip and broccoli. 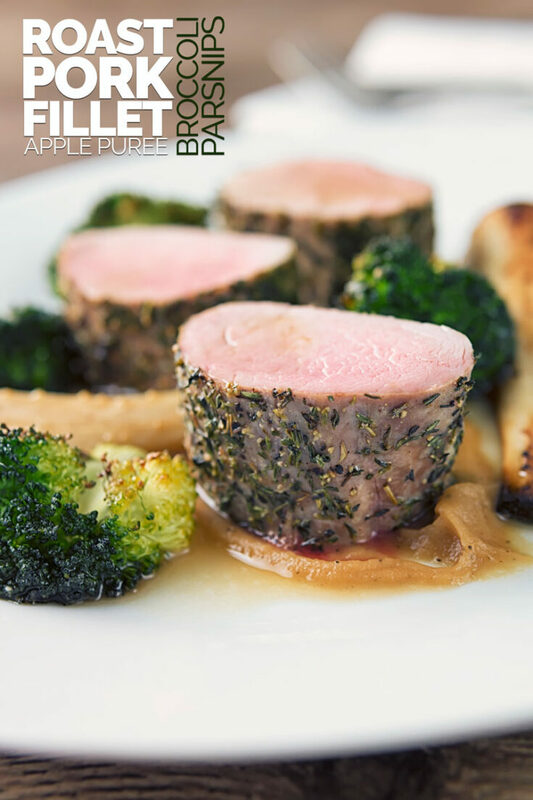 Roast Pork Fillet with Baked Apple Puree. 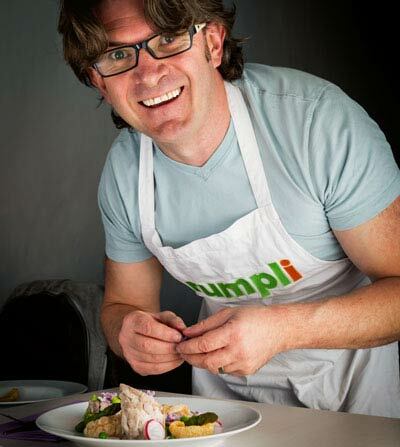 I honestly and wholeheartedly believe that cooking is not difficult. It is nothing more than applying the right amount of heat for the right amount of time. Getting flavours right is just about understanding what works well together and what doesn’t. This recipe whilst looking rather complex is remarkably simple. It requires nothing more than a bit of concentration and about an hour of your time. You can even prepare the baked apple puree and cider sauce in advance and reheat them later. 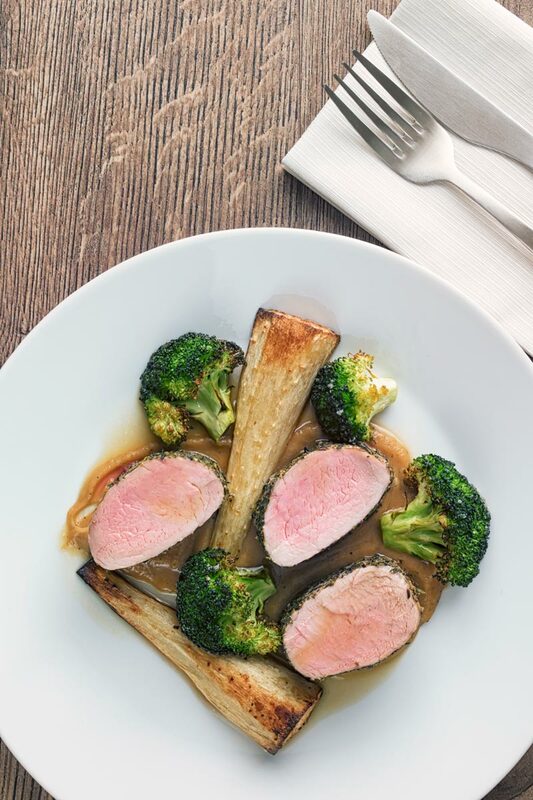 Because of the nature of pork fillet you can add more of them and the cooking time remains unaffected. In fact, as long as you have oven space you can cook this for two people as I have here or two dozen. The only difference would be the amount of time that it takes you to prepare the ingredients. 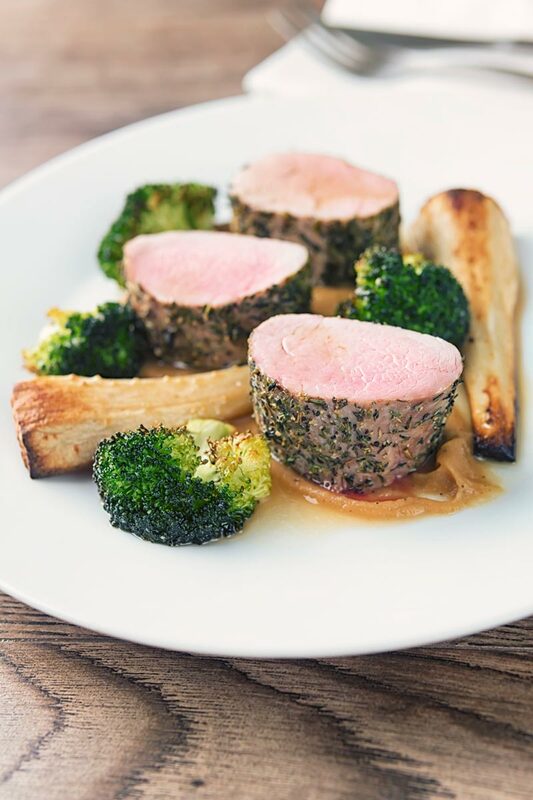 Pork fillet is also known as pork tenderloin. It is a very lean cut of meat and as a result, overcooking it will result in a pretty tasteless and tough piece of meat. It takes very little time to cook and really does benefit from being left pink when cooked. I personally prefer to roast in a hot oven at 200°C or 400°F rather than the usual 180°C. I just find that it works better. As it cooks so quickly, we are talking 15-20 minutes you want to ensure that the meat is not put in the oven straight from the fridge. There is no need to bring it to room temperature, but I find I get the best result for roast pork fillet by removing it from the fridge around an hour before I start cooking. You can sear the meat if you like, for instance, in this roast pork tenderloin with apricots recipe, I do sear the meat. But because pork fillet is rolled in thyme I choose not to as it would burn the thyme creating a bitter flavour. You can also make bacon wrapped pork tenderloin which is a wonderful way to help add moisture if you want to cook for longer. The secret to cooking this recipe successfully is all in the timing. I have broken down the recipe instructions into the order that things should be started. Begin by peeling and preparing the parsnips and placing them in a hot oven. Once you have done this you have 10 minutes to test the cider, peel and cut the apples and place them in the oven. 5 minutes after they have gone in the oven you should get the cider sauce started. Then 5-10 minutes later you need to drop in the pork. Again 5-10 minutes later in go the broccoli florets. As you can see there are no pinch points. There is plenty of time between each action to prepare for the next. 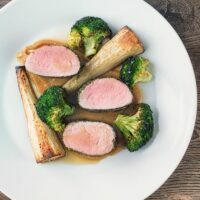 Simple cooking techniques, perfect timing, fab presentation and great flavour combinations make this roast pork fillet with baked apple puree achievable for even novice home cooks. Peel and top and tail the parsnip then cut in half length ways. Drizzle with oil and season generously with salt. Place on a roasting tray and pop it in the oven. Cook for 45 minutes at 200°C or 400°F. Peel and core the apples. Cut into quarters and place on a small roasting tray with the butter. Sprinkle over the salt, sugar and sage. Roast for 35 minutes or until soft along with the parsnips at 200°C or 400°F. Blend to a smooth puree passing through a fine sieve to refine if you like..
Heat the butter in a pan over a medium heat. Finely slice the shallot and add it to the butter and cook until softened. Pour in the cider add a pinch of salt and reduce down to around 75ml. Season the pork fillet with the thyme and then generously with salt and pepper. Place on a roasting tray and drizzle with the olive oil. Roast in the oven at 200°C or 400°F for 15-20 minutes. You want the internal temperature to reach 58°C 135-140°F before removing from the oven. Cover with foil and allow to rest for 5-7 minutes. Place the broccoli in the roasting pan with the pork and parsnips. Drizzle with oil and season with salt and pepper. Roast in the oven at 200°C or 400°F 15 minutes. If you have cooked the puree in advance re-heat it. Pour the resting juices into the sauce and reheat. Add a swipe of the puree to a warmed plate. Carve the pork into 6 slices and add 3 to each plate. Finally add a little of the sauce and serve. Look for a 'mealy' or floury apple for the puree, something like a red delicious would be perfect. In the absence of this older apples tend to be more floury, but if you can only get a firm apple then bake them for up to 30 minutes longer. Calorific details are provided by a third-party application and are to be used as indicative figures only. pork and apples compliment each other so well. I am sure this plate with all the different flavors going on was so delicious! Oh Brian! That looks so delicious! Simple and done to perfection! I am in love with all things pork! Can’t wait to try this! This pork is calling my name! I love the simplicity of this dish but has such sophisticated flavours. Delicious and perfect for an Easter hiliday dish. Mmmm. Recipe saved! Pork and apple is such a delicious classic combo! This looks 5 star! Love roast parsnips too!